Fishers are also known as fisher cats but they’re not cats at all. The fisher is a large member of the weasel family. Its name is misleading because unlike the closely related river otter, fishers seldom eat fish. The fisher is one of a few carnivores known to prey on porcupines; they also eat rabbits, small rodents, birds, carrion, fruits and nuts. 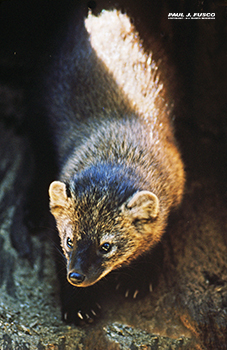 Though active day and night, fishers are primarily nocturnal. Learn more about the mysterious fisher with this CT DEEP Master Wildlife Conservationist presentation at 5 p.m., Tuesday, April 16 at the Essex Library. Master Wildlife Conservationist program and is now active volunteering and presenting programs on wildlife to libraries and nonprofit organizations.